I got a Kindle for my 49th birthday and I can’t help but wonder what it will enkindle in me. When I checked the OED for “kindle” I found, as I expected, that the word means to set aflame or to arouse or inspire. The more surprising meaning was to bring forth or give birth. At the very least, the Kindle and other e-readers will bring about passionate discussions of text, meaning, materiality and technology. Though I am a firm multisensory lover of printed materials that I relish marking up with abandon, I found myself immediately loading my Kindle up with the Complete Works of Shakespeare, the Complete Works of Dickens, the King James Bible, the short stories of Poe & Bierce as well as Brave New World, Brave New World Revisited, Chrome Yellow , Wieland and 1984 – a load of books that would fill two steamer trunks and weigh several hundred pounds. This 7.5″ x 4.8″ e-reader is only 8.7 ounces and could fit in a generous jacket pocket – no steamer trunks or roller-luggage required. Lest the reader think this a shameless promo disguised as a blog posting, let me add another fact: it already broke. I don’t know what happened, but when I went to dinner at my in-laws and went to show off the Kindle, it wouldn’t even power on though I had half a battery charge when we left the house. When I tried to charge it with the handy wall & computer compatible plug, the charge light wouldn’t even come on. So I’m returning it for a replacement. When I called Amazon, initially they tried to re-boot my Kindle by remote but when that didn’t work the service agent told me I’d receive a replacement within a day. I was pleased with his service but the remote re-boot reminded me of the ironically Orwellian way Amazon remotely deleted 1984 and Animal Farm from customer Kindles without their permission. Even with this initial glitch in my e-reader experience, I find myself looking forward to getting a functioning Kindle pre-loaded with the books I already downloaded and paid for. It’s not that I planned to sit down and read them all through, but I thought such a collection in an electronic format might be very useful to reference during teaching. 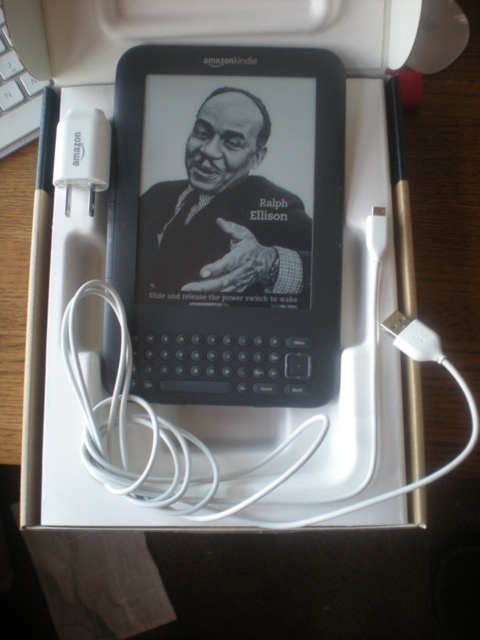 Of course, I could access the same texts online as in the links above, but if I wanted to hold class outdoors or not be posted at the podium, the portable e-reader might be very handy. Kindle is the trademark name for Amazon’s e-reader but there are several non-compatible competitors like Barnes & Nobel’s Nook, the Literati Digital Reader by Sharper Image or Sony’s Digital Reader. Naturally, due to the ‘wisdom’ of market competition, none of them are compatible. While the “electronic paper” and “digital ink” used in e-readers is the result of R&D attempts to give the most print-like reading experience, I found myself wanting a backlit screen when I began to read it in a dimly lit room. When I get my new Kindle, I’ll post a follow up assessment of its usefulness for quick reference, powerful searching and annotation of my steamer trunkloads of texts. I have been waiting for Google’s version of the iPad to begin my e-reading. I’d hoped for a device to surf the Web if needed, so I have that enormous reference-set at my disposal. With Flash support (shame on you, Steve Jobs) I could also use my tablet to collaborate with co-authors via Googledocs. When it comes to paper texts, however, I’m fussy. Teaching texts get marked, but rare ones and my pleasure reading are treated reverently. I rarely mark them, though I keep notebooks, again fussily organized, with reading notes from the works.